The wildfires have been mostly squelched in Northern California but the long road to recovery still stands ahead. New satellite imagery reveals just how far the damage extends from the destructive firestorm that rocked the region earlier this month. As of Wednesday, the fires were 93% contained according to CALFIRE, but they’ve left a heartbreaking wake of destruction. Nearly 111,000 acres have burned by the Tubbs, Nuns and Atlas fires since their ignition on Oct. 8. The largest of the fires was the Nuns fire, which accounts for roughly half of the acreage burned. The scars on the land are clear in satellite imagery published earlier this week by Planet, a private company with a fleet of tiny satellites orbiting the Earth. 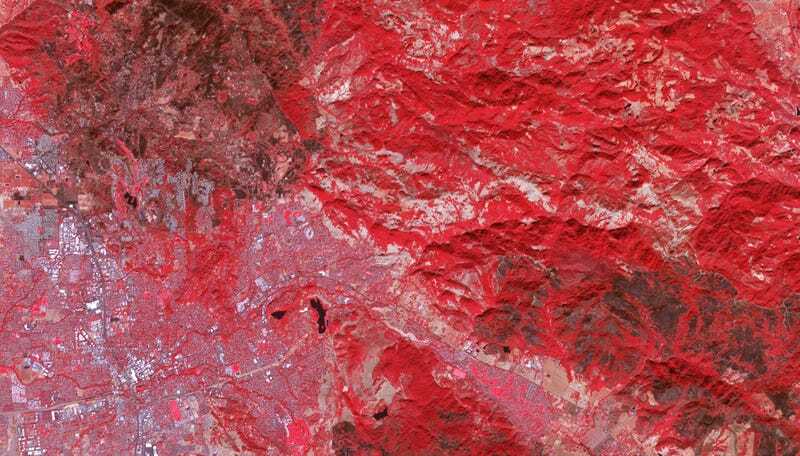 The false color before image show healthy vegetation in red. The after image—actually a mosaic of images captured on October 22nd and 23rd—shows the fresh burn scars that now mar the landscape in black. Of the three big fires, the Tubbs fire—visible in the upper left corner of the satellite image—has wrought the most destruction. Planet’s before and after imagery is high resolution enough to zoom in to get a neighborhood-level view of the damage from the fires. For fires that destroyed 6,768 structures and damaged another 476, that neighborhood view provides important context for insurance claims and the recovery process as well as just giving relatives who haven’t heard from family members a chance to see how close their homes were to the fires. The Tubbs Fire is responsible for destroying 5,400 of those structures after it marauded through Santa Rosa’s northern neighborhoods. It’s by far the most destructive wildfire in California’s history, nearly doubling the structure destroyed in the 1991 Tunnel Fire in the Oakland Hills that held the dubious record until this year. The Atlas Fire, which on its own is the ninth-most destructive in California’s history, ran right up the eastern edge of Napa. It also destroyed or damaged 11 wineries. Planet’s satellite imagery reveals some of that damage along Silverado Rd., which heads north out of Napa. The fires were likely started by downed power lines, though it’s still under investigation. The power lines are maintained by Pacific Gas and Electric, which has been cited for failing to properly keep up-to-date on maintenance. There’s also a host of meteorological and climate change factors that primed the region to burn and whipped the flames into a frenzy. 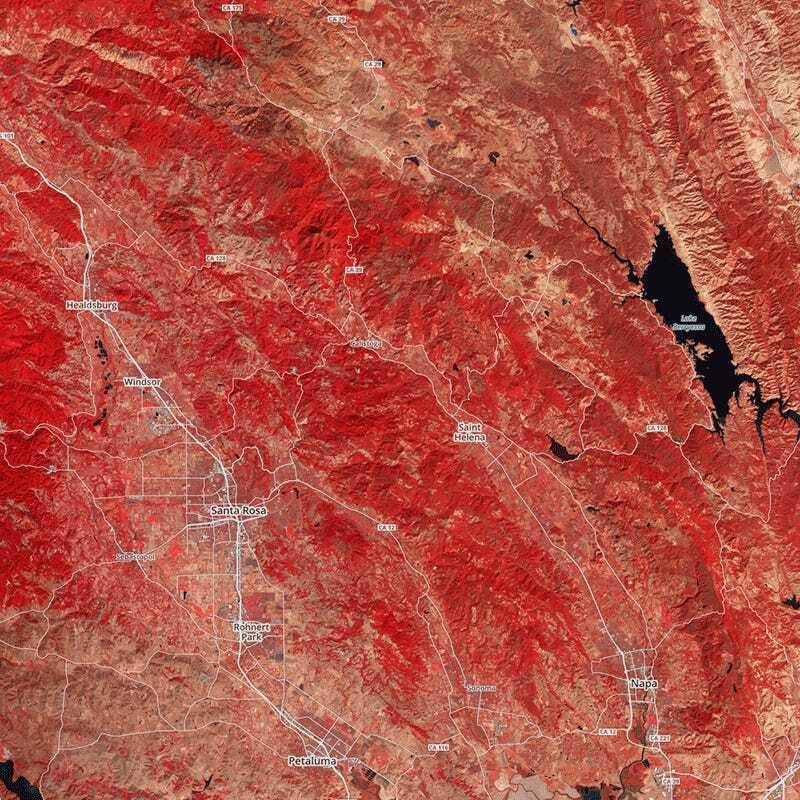 These satellite images show what happens when all those factors combine. Moody’s projects that the disaster could cost upwards of $4.6 billion. Crews are searching for toxic waste and builders are facing a massive undertaking due to permitting and the potential for building material costs to skyrocket. All that ensures that the impacts of the fires will continue to be felt for years to come.